If your letter also includes a box with ‘You sat the National Course(s) listed below but have not attained Grades A-D’, this means you failed the exam for the courses listed in the box. Any Higher or Advanced Higher units that you passed within the course will be shown in the National Units section of your certificate. Hover over the letter to find out what each part means. I am pleased to enclose your Scottish Qualifications Certificate. 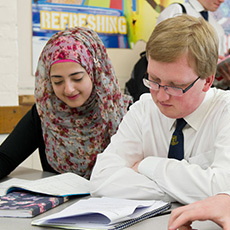 If you would like information about SQA and our range of qualifications, please visit our website at www.sqa.org.uk. I send you my best wishes for your future. You sat the National Course(s) listed below but you have not attained Grades A-D in the external exam. The result for each course is shown below. Any units you have attained will be listed on your Scottish Qualifications Certificate in the National Units section. List of National Courses where exam was failed. Who to contact with queries about your certificate. 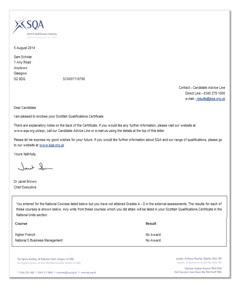 Address SQA sends certificate to.